For those of us who work online (or just like to stay connected), the search for good Wi-Fi is a constant companion on our travels. I always recommend having back-up Internet options in case the Wi-Fi isn’t so great (or is nonexistent due to power outages, etc.). For those times when you have a bad Wi-Fi connection while traveling, one of the best back-ups is connecting to data via a local SIM card (as long as you have decent cell reception, of course!). If you travel internationally and stay in one country for a while, buying a local SIM card is worth the effort. Someone in the Nomadtopia Community on Facebook recently shared a great blog post that outlined a couple’s experiences buying SIM cards for international travel. There’s tons of great info in that post, so be sure to check it out! I thought I would add to that post by sharing my own experiences buying local SIM cards abroad, because I’ve traveled to some countries they didn’t cover, or in the same countries my experience was different. Note: Cell phone and SIM card plans, offers, and prices change frequently! This information reflects my experience at a particular point in time, but things might have changed since then. In my experience, cell/data service tends to be quite cheap outside of North America. While I didn’t always keep great notes on the specific prices of plans I used, I don’t think I spent more than US$10/month on data/texts/calls in any of the countries listed here except the U.S./Canada. recharging with a credit card online or on the phone (I probably only used this last option in the U.S., even if it was available in other places). I’m American, which I believe makes getting a SIM card in the U.S. a little easier, because I have a U.S. mailing address and credit card. But because I don’t live in the U.S., I don’t have a regular plan there, so I use a prepaid SIM card when traveling in the United States just like anyone else. From 2008 to 2012 I used a cheapo prepaid phone from Virgin Mobile, and I kept enough money on it so I could keep the same number and use it every time I went back to the States. In 2012, I bought an unlocked Galaxy Nexus smartphone (directly from Google) and got a SIM card for AT&T’s GoPhone service for US$10. Since then, depending on how long I was staying, I’ve done either strictly pay-as-you-go, for roughly 10 cents a minute, or gotten a monthly no-contract plan that includes some amount of minutes, texts, and data. In 2014, I came back to the States and discovered that because I hadn’t added credit to my SIM/account in more than six months, I’d lost my number, so I had to get a new SIM card (at AT&T again). This time, because I knew I’d be in the States several times in the coming year, I put $100 on the card, which guarantees a full year of service. My U.S. AT&T GoPhone plan included roaming in Canada, so if I remember correctly, in 2012 and 2013 I used that for text messages in Vancouver and surrounding areas without any problems. But beware of data usage while roaming! In 2013, on a road trip to the Okanagan Valley, we turned the data on briefly because the GPS had gotten disconnected, and blew through about US$18 of credit in just a few minutes. We arrived in Kuala Lumpur in August 2013, and I bought a SIM card from U Mobile at one of the big electronics malls (I think it was either Plaza Imbi or Plaza Low Yat). Buying a SIM card in Kuala Lumpur was easy; the guy spoke decent English and they had some documentation in English as well, which helped him explain the plans to me. I just had to show him my passport and then pay for the SIM card and initial credit. I can’t find the price in my notes, but I’m pretty sure it wasn’t more than US$10. I can’t remember how I topped up the SIM card in Malaysia, honestly. The service worked fine all over Malaysia, and we may have used it in Singapore, too. I remember that the notification text messages were in Malay so I sometimes had to get someone to translate for me. In November 2013, I bought a SIM card for Indonesia from simPATI/Telkomsel at an electronics store at the airport in Jakarta. I had a bit of a tough time communicating with the girl who worked in the shop, but in the end it was a straightforward purchase (no ID or anything required); I paid 65,000 Rupiah (less than US$6) for the SIM and initial credit. I used this one a lot, because the Wi-Fi in Bali wasn’t that great where we were staying (a common complaint in Bali, unfortunately!). I usually did an electronic top-up at a shop when I needed more credit. I bought a SIM card for India while we were in Udaipur for several weeks in January 2014. I decided I didn’t want the guy at the local kiosk to take my passport and go get the card for me, so Roberto and I took a tuk-tuk to the customer service office for Airtel, which an Indian friend had recommended. It was a more involved process and they asked for more documentation than in Malaysia, including a business card from the place we were staying and a copy of my passport and visa, and I had to fill out a couple forms, but it didn’t take very long and they set me up with a SIM card and some initial credit for calls/texts/data for 555 rupees (about US$9). I did electronic top-ups at kiosks, and the service worked well everywhere we went in India. We spent a couple months in Chiang Mai in March and April of 2014. A friend had recommended DTAC for cell service, so I went to their shop at the Kad Suan Kaew Shopping Centre. As in India and Malaysia, buying a SIM card in Chiang Mai was easy; the person spoke decent English, and explained the plans and got me set up with a SIM card and some initial credit for calls/texts/data for 269 baht (about US$8). DTAC has English documentation on their website and in the automated phone system, so I was able to buy refill cards at 7-Eleven and then activate the credit on my phone, or do an electronic top-up. The service worked well in southern Thailand too. Roberto and I both had local SIM cards that we’d been using for years. When I first moved to Buenos Aires in 2007, I bought a super-basic phone and a Movistar SIM (which took a little bit of paperwork but wasn’t too complicated) and have been using it ever since—until this year. When we got back in June 2014 after being gone for a year, my SIM didn’t work anymore, but Roberto’s worked just fine. We decided we didn’t really need two anyway, so we’re just using his in my phone. We spend just a couple dollars a month for calls/texts (we don’t use it very much!) and don’t have a data plan, but we can activate data when we need it; 15 MB is less than 3 pesos (US$0.25). 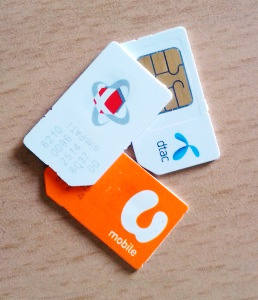 Do you use local SIM cards when you travel? What experiences have you had buying them in different countries? What other backup methods do you have for getting online? I’ll definitely be putting this on my list of references for traveling. I always get a local SIM card when I’m traveling, but it’s definitely more of a hassle in some countries than others. I’ve actually had the worst experiences getting one in the US — although at the time I wasn’t a resident, so that may have affected things. The easiest one for me so far has been Hong Kong — you can get them at 7-11s and they’re crazy easy to top up. Yes, it can really vary from country to country. Glad to hear Hong Kong is an easy one! Thanks for this helpful post. Buying a SIM card for my wife and my unlocked iPhone 4’s is the first thing we do once we are in a foreign country. There are some ins and outs, but we always ended up with decent phone service, and as you mentioned, it is really cheap in Asia. In Australia, it was a bit more expensive, but still less than the cost in the U.S. By the way, in the U.S. we use blackwireless.com which uses the AT&T network but costs much less. We pay $30/month for unlimited calls and texts and it includes 200MB of data, which is always plenty since we have WiFi in the house where we are currently house sitting. Awesome, thanks for the tip on Black Wireless! So glad it’s helpful, Catherine! Definitely worth scoping out in advance, whether it’s making sure your accommodations have Internet access or finding out what the options are for getting a local SIM. Definitely bookmarking this for later! I just started getting SIM cards when traveling and now I don’t think I can go back to not having access to my phone. 😉 It was super easy to get a SIM card in the UK, and then refill it when I went back a few months later, but I found it more difficult to find something easy and inexpensive in Germany (and I even speak German!). Thanks for the tips! That’s too bad that it wasn’t as easy in Germany, but great to hear that you were able to continue using the same card for more than one trip! That’s another good reason to get one for places you visit regularly, because then you’ll have service almost immediately when you arrive.